Product Details - Material - Soft Rubber, Suitable -Puppies, Small and Medium Breed, Color -Multiclor, Size-Small (7 cm). Product Information - This interactive feeding ball will be challenging the dog?s brain for getting food. 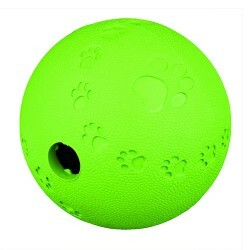 The bright attractive color of this toy will attract your dog and keep it engaged. This ball rolls and ensures maximum pet engagement.